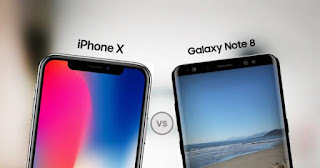 If you're looking for the best of the best in the mobile market , without a doubt you'll have an eye on both the iPhone X and the Samsung Galaxy Note8, and it does not hurt to recognize that Koreans this year have done a great job with your flagship. Unfortunately, with the emergence of the iPhone X, most top of the range have had no choice but to step aside : there is no terminal with higher benchmarks (ie, the bionic chip A11 sweeps in front of others), his OLED is ironically even better than that of any phone of its manufacturer Samsung and only the Google Pixel 2 XL exceeds it by one point in terms of camera quality . So, it seems that for the iPhone X this season 2017-2018 is presented as a walk. Well, no. Because in fact the Booredatwork.com YouTube channel evidences that the tenth anniversary special edition device bites the dust before the Samsung Galaxy Note8 in one thing, but one very important thing: the speed of internet browsing. And the Samsung Galaxy Note 8 is by far, faster than the iPhone X ... but only surfing the Internet. What is the reason for this remarkable difference? No software, but hardware, specifically the respective LTE modems that integrate both . 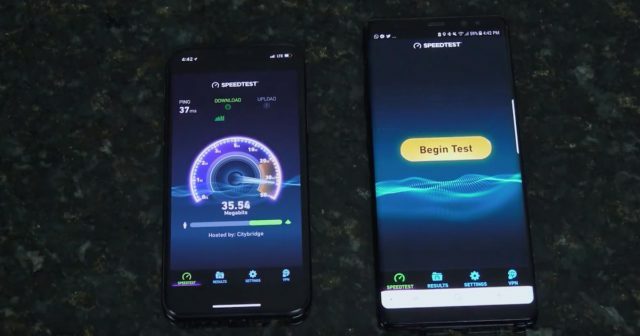 And is that while the iPhone X's modem reaches theoretical speeds of 600 Mbps download, the Note 8 modem could exceed the Gigabit. By the way, the latter manufactured by Qualcomm, the company with which Apple has enough strips and loosen . So much so that it is expected that in 2020 it will be Intel that will provide the modem to the iPhone that year , which will use 5G transmission speeds.